The Burlesque Top 50 2012 No. 1, Dirty Martini, from a Strip Strip Hooray! shoot by ©Kaylin Idora. Not to be used without permission. Always close to your hearts and loins, Dirty spent much of 2012 on the road with an assortment of fellow burlesque big hitters. 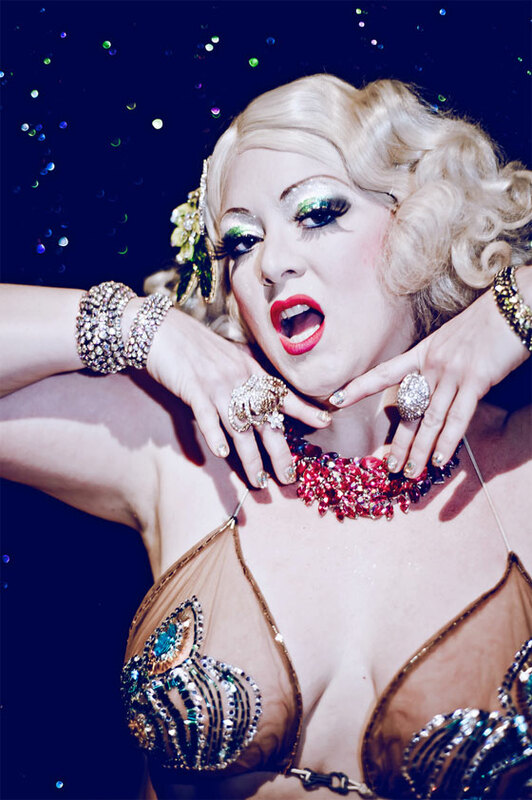 She spread the gospel of grind across Europe with her Cabaret New Burlesque pals, Julie Atlas Muz, Kitten on the Keys, Mimi Le Meaux, Catherine D’Lish, Roky Roulette, Evie Lovelle and Kitten De Ville, and she wowed US crowds on Dita’s Strip Strip Hooray! 2012 tour with Murray Hill, Perle Noire, Catherine, Monsieur Romeo, Lada Nikolska, Selene Luna and, of course, Dita herself. You can read her Strip Strip Hooray! tour diary here… She found the time to make a fantastic appearance at the New York Burlesque Festival, and she was a guest of honour at BurlyCon, teaching three excellent sessions. You may also have spotted her on the cover of 21CB’s first print edition! I’m cheating a bit, because everyone loves her balloon pop. Posted in 2012, but actually from the 2010 Toronto BF. Enjoy!